Confusion surrounds claims that an al-Qaeda plan to attack Heathrow airport was foiled by British police. Reports claim that a terror suspect arrested in Pakistan had a laptop with maps and photographs of Heathrow, and underpasses of other London buildings. The Times newspaper said an attack was in its "final stages" but had been averted after UK police acted on Pakistani intelligence. But government officials in Pakistan deny any details were passed to the UK. The Times claimed that Mohammed Naeem Noor Khan had visited Britain at least six times in recent years. He had been passing coded information to senior al-Qaeda figures over the Heathrow plot, the paper alleged. Reports from the AP news agency quote an unnamed intelligence official who claims Mr Khan's computer, seized when he was arrested, contained photographs of Heathrow airport and underpasses running beneath several buildings in London. And an anonymous source told the AFP news agency that information from the arrest had provided a "deep insight" into the workings of al-Qaeda. The source told AFP: "[Mr Khan] was involved in planning for attacks at Heathrow airport London some time ago and was wanted by the US Government." The source also claimed that information from Mr Khan's computers had been passed on to both US and UK officials. But Pakistan's interior minister Faisal Saleh Hayyat later said that the UK authorities had not received information from Pakistan. "There is no specific information that we gave to Britain," said Mr Hayyat. The BBC's correspondent in Pakistan, Zaffar Abbas, said that nobody there had confirmed the existence of a Heathrow plot. "Even in the background briefings they have not suggested any plan about Heathrow," he said. He added that the Pakistani investigators had not revealed details of what they found on Mr Khan's computers, but had confirmed that he was an al-Qaeda "communications expert". And BBC home affairs correspondent Andy Tighe said he understood the photographs of Heathrow uncovered in Pakistan were three or four years old. The Home Office said it would not comment on the details of intelligence, but confirmed that there had not been a specific threat. A spokeswoman said: "If there had been a specific, credible threat then we would let the public know." Leader of the Commons Peter Hain also denied there was a "specific threat" but claimed the government was "constantly alert". "We know that al-Qaeda networks have been active in Britain," he told BBC Radio 4's Today Programme. While refusing to comment on specific intelligence, he added: "What you are seeing here is the result of constant surveillance, constant intelligence." Mr Khan's capture is one of at least 18 arrests of suspected al-Qaeda operatives in Pakistan since 12 July. 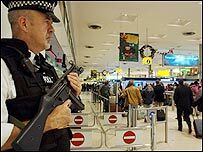 Heathrow airport has been linked to terrorist attacks several times in recent years. In February last year 1,700 policemen and 450 troops were sent to the airport after an alleged Algerian plot to shoot down a plane was uncovered. Nine years earlier the IRA launched a series of mortar attacks on the airport, partially paralysing the capital's main air routes. The latest apparent terror threat comes on the same day that a senior naval officer announced that the merchant navy was at risk of an al-Qaeda attack. Admiral Sir Alan West, the First Sea Lord, said that he had seen evidence of plans for terrorist attacks on commercial shipping. But the MoD stressed that the admiral was merely reiterating old information and there was no new threat. "The photos of Heathrow airport were three years old"
"It is believed Naeem Noor Khan has offered his services to al-Qaeda as a computer expert"